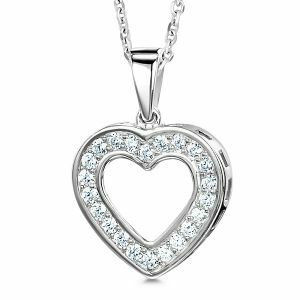 A beautiful modern classic heart shaped diamond pendant set with round brilliant cut diamonds. A deceptively simple, yet adorable Round Brilliant cut Diamondheart-shaped pendant. The pendant holds 22 x 1.25mm Round Brilliant cut Diamonds within a grain settings, total carat weight of 0.25cts. Each Diamond has been graded G Colour, SI1 Clarity prior to being expertly set. The elegant heart shaped pendant is attached to the chain, supplied with this design, by a loose swinging bail. The curb chain is in 18" in length and comes in finishes of 18 Carat White or Yellow Gold and 950 Platinum. When the finished pendant has been crafted to order, it will arrive to you meticulously packaged, ready for that special occasion. Please allow 4 weeks for delivery as each pendant is made to order.